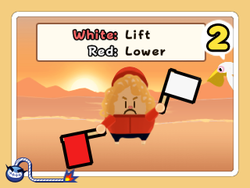 Flag Waver is one of Wario-Man's microgames in WarioWare: D.I.Y. Showcase. It later returns as one of Young Cricket and Master Mantis' microgames in WarioWare Gold. Wario is on a pirate ship plank holding two flags: a red one and a white one. Above him, there is a bubble ordering Wario to lift one of the flags. The player must poke the correct flag to win. If Wario doesn't raise the correct flag in a certain amount of time or raises the wrong flag, the fish will get Wario, and the player loses. 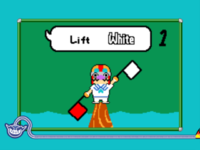 In WarioWare Gold, there is a boy on a beach with the flags and the bubble ordering him to lift one of the flags. After a while, a pelican peeks in from the right, waits for a few seconds, and counts down from 3 to 1. The player must lift or lower the flags as ordered before the pelican finishes counting down. If they fail to do this, a beach ball knocks the boy away, and the player loses. Level 1: One flag must be raised or lowered. Level 2: Both flags must be raised or lowered. Sometimes the command is to lift or lower both flags at the same time. Level 3: Similar to Level 2, but the colors for red and white are swapped. This page was last edited on January 29, 2019, at 11:49.